Bike motions at L.A.’s Public Works Committee, Ride4Love, VooDoo ride, Rail Passenger Association meeting, L.A. City’s Bicycle Advisory Committee, new walk trail in Silver Lake, and more. Tuesday 2/6 – The L.A. City Bicycle Advisory Committee will meet at 7 p.m. at the Hollywood Neighborhood City Hall at 6501 Fountain Avenue. Details at Facebook event. Wednesday 2/7 – The L.A. City Council Public Works Committee will consider two motions that aim to curtail city liability by curtailing bicycle facilities – despite most lawsuit incidents not taking place on streets with bike facilities – and much greater payouts coming from crashes involving cars. The committee will meet at 1 p.m. at the Third-Floor Public Works Hearing Room at City Hall at 200 N. Spring Street in downtown L.A. (public entrance on Main Street.) Details at meeting agenda. Thursday 2/8 – BikeSGV will be holding a general meeting for community input on advocacy efforts. The meeting will take place from 7-8:30 p.m. at Bike SGV’s Jeff Seymour Family Center at 10900 Mulhall Street in El Monte. Details at Facebook event. Saturday 2/10 – L.A. City Councilmember Mitch O’Farrell and the L.A. DWP host the grand opening ceremonies for a new walk path on the southern end of the Silver Lake Reservoir. The ribbon-cutting will take place at 10 a.m. at the South Dam east entrance on Silver Lake Boulevard at Rockford Road. Details at Facebook event. Saturday 2/10 – East Side Riders will host the VooDoo Ride, starting at 3 p.m. at 22nd. Street Landing at 141 W. 22nd Street in San Pedro. Details at Facebook event. Sunday 2/11 – The Rail Passenger Association of California and Nevada will meet at 10 a.m. upstairs at Philippe’s at 1001 N. Alameda Street, near Union Station. The main topic will be to discuss a game plan to counter the “theft” of Union Station, shops etc vs. convenience for passengers. The meeting is free and open to the public. 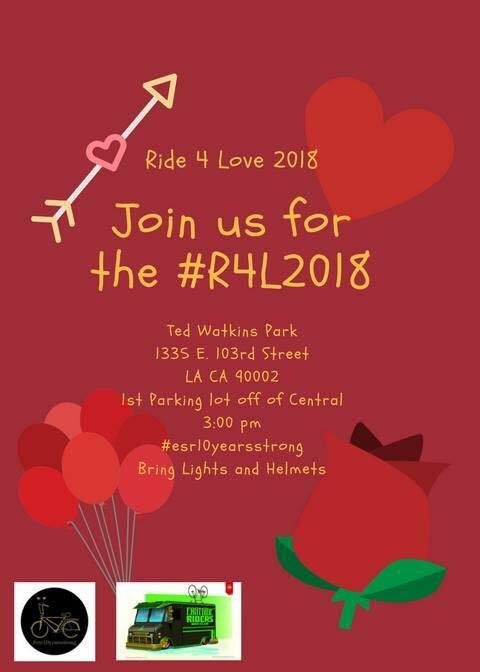 Sunday 2/11 – Watts’ own East Side Riders host the Ride4Love, starting at 3 p.m. at Ted Watkins Park at 1335 E. 103rd Street in Watts. Details at Facebook event. Sunday 2/11 – Walk Bike Burbank hosts a ride to show love for the Verdugo Bike Lanes! Meet at noon at Lincoln Park at 300 N. Buena Vista Street in Burbank. Details at Facebook event. Bike tours in San Gabriel Valley and San Fernando, L.A. City's Bicycle Advisory Committee, and BiciParranda. CicLAvia returns to the heart of L.A., plus Benjamin Torres ride, UCLA bike-share, L.A. City open space plan and much more!